Alex Moseley was the workshop superintendent at the West Ham track. He was probably the best known and most skilful designer of speedway machines in the country. A Londoner, he began working as a mechanic on the famous Brooklands circuit in 1921. LEFT: the Alec Moseley "Super Frame". As a sideline he acted as passenger to side-car racing experts and was the first person in that capacity officially to lap Brooklands track at more than 100 m.p.h. When speedway racing arrived in this country, Alex was one of the first devotees of the game. He was attached to International Speedways, but in 1930 he joined Wembley and was in charge of their workshops for three years. In 1934 he took over at West Ham and was largely responsible for the " Hammers " winning the Championship in 1937 and finishing runners up in 1938. During the war he was R.A.F. fitter-instructor-for 6 weeks and then took over the task of " Chief Planner " of centre sections of aircraft. It was during his period at West Ham that Alec developed what was to become known as the "Super Frame" and an article in a 1939 publication wrote the following report. 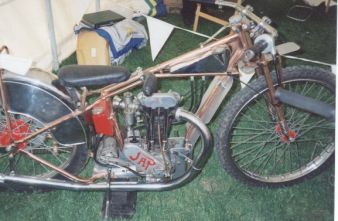 Alec Moseley, West Ham mechanic, has built a super frame which by the saving of weight in its construction Has made a saving of 70lbs in weight on the finished machine as compared with the standard bike. 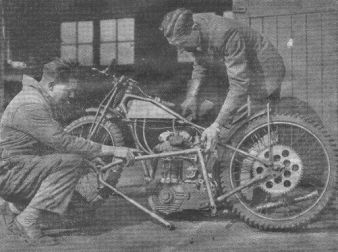 The "Speedway World" correspondent, Mr G.A.Phillips, called upon Alec Moseley to obtain details of this job, and on enquiring of West Ham's tuning wizard, whom he found engaged upon a complicated algebraic equation relating to the new frame, was taken to inspect it. After a careful study of the frame, Mr Phillips formed the opinion that it was without doubt the finest piece of workmanship that he had seen in any speedway workshop. 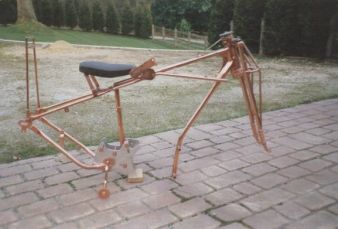 Built entirely of aircraft tubing and specially selected light-weight metals, the frame alone cost over Ł25, and when the machine was fully completed it would weigh 70lbs lighter than the normal machine, that is, 170-180lbs compared with the 240lbs of the standard bike. Mr Phillips added, "I asked Alec if this enormous saving of weight would affect the strength of the frame. He looked at me as if I should know better, and in reply he unbolted one of the back section members of the frame, clamping this in the vice, and giving me a piece of tube 4 foot long as a lever, asked me to bend it if I could. I struggled for about five minutes, and at one time I succeeded bending it about three inches, but as soon as I released the pressure, it sprang back to its original position. Alec grinned at me which led me to make more of an effort, and giving one last tremendous heave, I managed to produce a very ominous crack from the metal. But Alec still grinned at me. As I looked down at the frame again I found it unharmed, the crack had come from the piece of tubing I had been using as a lever." "There" said Alec, "It's stronger. The tube you have broken is what we used to make frames from. No, that frame has taken me all the winter to make, and believe me, I know now just what that tubing will stand up to." The frame had been purpose built originally for Eric Chitty, with every part of the machine, apart from the engine and tyres, hand built. It was eventually to be used by the West Ham Team, and there is nothing as yet to suggest that these frames were sold commercially outside of the West Ham team. In 1953, Ipswich signed up Alec as track mechanic, and whilst there he designed another frame, and following trials, at least three of these were initially made and used, although as yet we do not have pictures of these. Image: Alec points out some of the differences of his new frame compared to an old one. Later, Alec was to introduce the Vincent motor into his frames and give us the Moseley Vincent "Vampire".